More Data or Fewer Predictors: Which is a Better Cure for Overfitting? To create more training data out of thin air, we can resample (perhaps more vividly, oversample) our existing data. This is called bagging. Let's illustrate this using a fundamental factor model described in my new book. It uses 27 factor loadings such as P/E, P/B, Asset Turnover, etc. for each stock. (Note that I call cross-sectional factors, i.e. factors that depend on each stock, "factor loadings" instead of "factors" by convention.) These factor loadings are collected from the quarterly financial statements of SP 500 companies, and are available from Sharadar's Core US Fundamentals database (as well as more expensive sources like Compustat). The factor model is very simple: it is just a multiple linear regression model with the next quarter's return of a stock as the dependent (target) variable, and the 27 factor loadings as the independent (predictor) variables. Training consists of finding the regression coefficients of these 27 predictors. The trading strategy based on this predictive factor model is equally simple: if the predicted next-quarter-return is positive, buy the stock and hold for a quarter. Vice versa for shorts. Note there is already a step taken in curing data sparseness: we do not try to build a separate model with a different set of regression coefficients for each stock. We constrain the model such that the same regression coefficients apply to all the stocks. Otherwise, the training data that we use from 200701-201112 will only have 1,260 rows, instead of 1,260 x 500 = 630,000 rows. The result of this baseline trading model isn't bad: it has a CAGR of 14.7% and Sharpe ratio of 1.8 in the out-of-sample period 201201-201401. (Caution: this portfolio is not necessarily market or dollar neutral. Hence the return could be due to a long bias enjoying the bull market in the test period. Interested readers can certainly test a market-neutral version of this strategy hedged with SPY.) I plotted the equity curve below. Next, we resample the data by randomly picking N (=630,000) data points with replacement to form a new training set (a "bag"), and we repeat this K (=100) times to form K bags. For each bag, we train a new regression model. At the end, we average over the predicted returns of these K models to serve as our official predicted returns. This results in marginal improvement of the CAGR to 15.1%, with no change in Sharpe ratio. Now, we try to reduce the predictor set. We use a method called "random subspace". We randomly pick half of the original predictors to train a model, and repeat this K=100 times. Once again, we average over the predicted returns of all these models. Combined with bagging, this results in further marginal improvement of the CAGR to 15.1%, again with little change in Sharpe ratio. The improvements from either method may not seem large so far, but at least it shows that the original model is robust with respect to randomization. But there is another method in reducing the number of predictors. It is called stepwise regression. The idea is simple: we pick one predictor from the original set at a time, and add that to the model only if BIC (Bayesian Information Criterion) decreases. BIC is essentially the negative log likelihood of the training data based on the regression model, with a penalty term proportional to the number of predictors. That is, if two models have the same log likelihood, the one with the larger number of parameters will have a larger BIC and thus penalized. Once we reached minimum BIC, we then try to remove one predictor from the model at a time, until the BIC couldn't decrease any further. 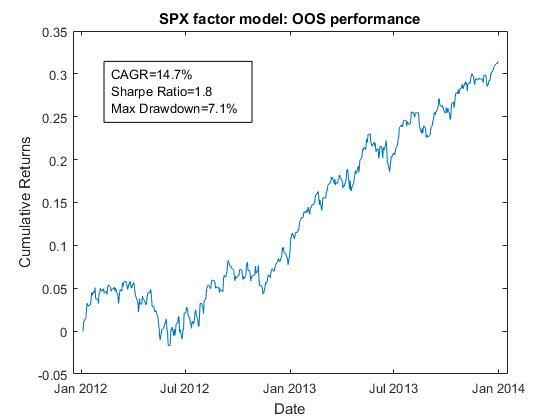 Applying this to our fundamental factor loadings, we achieve a quite significant improvement of the CAGR over the base model: 19.1% vs. 14.7%, with the same Sharpe ratio. It is also satisfying that the stepwise regression model picked only two variables out of the original 27. Let that sink in for a moment: just two variables account for all of the predictive power of a quarterly financial report! As to which two variables these are - I will reveal that in my talk at QuantCon 2017 on April 29. I will be moderating this online workshop for my friend Nick Kirk, who taught a similar course at CQF in London to wide acclaim. I will discuss in details AI techniques such as those described above, with other examples and in-class exercises. As usual, nuances and pitfalls will be covered.